When designer Sally Puddifoot became a mum she swapped Vogue magazine and the Milan catwalks for designing cards for friends at mother and baby groups. As she plans her first ever national trade fair, she tells us why she loves her new business Small Red Bird, and shares her big ambitions for her designs. My background is in textiles, I was a designer and art director for a print design studio. I designed for the range and managed the creative direction of a small team producing textile designs for fashion. We created designs for the highly innovative Italian silk printers, the trend-driven New York market as well as our own British high street. I travelled extensively with my job to the fashion capitals of the world, and my designs appeared in Vogue, Elle as well as on the Milan catwalks. I took nine months maternity leave after Charlie arrived and then returned to work for a short while, but I had already realised that Charlie needed me and I wanted to be there for him. He found separating from me enormously difficult, and I hated leaving him. I was already pregnant with Nell and I felt that as much as I loved my career, being with my children was the most important job at that point in my life. So I handed in my notice and became a full time mum. I have never regretted that decision. 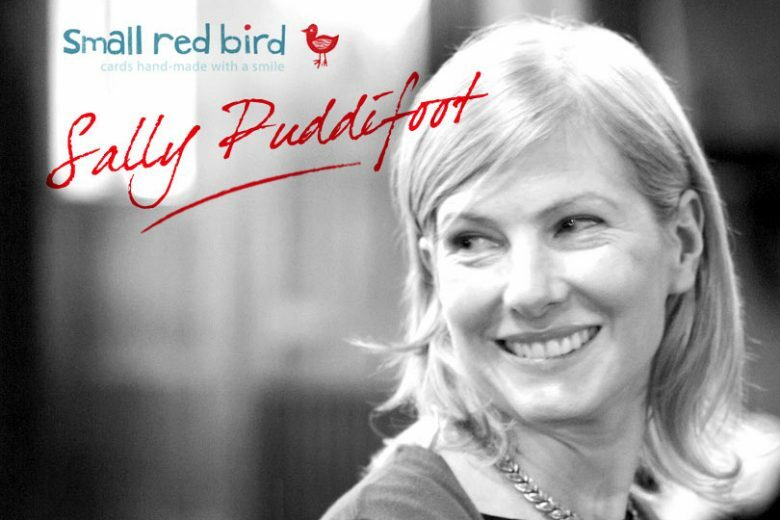 What inspired you to start Small Red Bird? I had always made greeting cards for friends and had always wanted to work as an illustrator. I was now sending numerous cards to mums as new babies arrived, or children had birthdays, so I just started making my own. I had a big box of origami papers I had once bought on a trip to New York years ago just because I loved the colours and patterns, I found some watercolour paper and transfer lettering in a cupboard and just started making. My friends loved them and encouraged me to make more. I soon started selling at Mother and Baby groups and to friends, but the key moment was when my local park cafe was beautifully refurbished and started selling lovely little gifts but had no greeting cards on display. So I went in with my cards offered them on sale or return, they took all 45 I had made, and put in a big order for more! I have an online shop, selling my range of cards and I supply shops in South West London and Surrey. Now I digitally print the cards, but they are still each and every one hand-finished with my beautiful Japanese origami papers. I am showing at my first trade fair in April, the British Craft Trade Fair (BCTF) in Harrogate, which showcases the best British craft products from jewellery to cards, and I’m thrilled to be part of this fantastic group of designers. I love what I do and I look forward to my weekdays as much as my weekends. It is very exciting seeing my brand and card range come together and I still get excited every time an order comes in. Because my product is handmade I feel very connected to it, and I really take pride in producing a quality product. How do you fit Small Red Bird around your family? We muddle along and generally it all works very well. Working from home means I can do the school run. Sometimes I have to burn the midnight oil if a big order comes in, but as my husband is self-employed too we can help each other out at our busy times. I do often work in the evenings as it’s quiet and I can think and get an enormous amount done, but I love my work so it’s not a chore. Holidays are the trickiest bit and I am lucky I have friends and family who are happy to help with my kids if I need it. It may get more difficult as I get busier but I am a great believer in things just working out somehow! I will be expanding my range and include note cards and stationary items next year, and my five year plan is to launch a range of textile products under the Small Red Bird brand. I still love fabrics and would love to make a coordinating home and accessories range that works alongside the cards. What have been your biggest successes to date? I am very proud of my Small Red Bird brand and the look of my cards, and I have worked hard to make it happen. I didn’t have any money to start up the business. Small Red Bird cards is where it is now because of my creativity, a lot of hard work and a little bit of luck along the way. Being selected to do BCTF is something I am very proud of and I think it will be a springboard to many exciting opportunities. What have been your challenges? Time is always an issue – I sometimes feel like I never have enough hours in the day. When Nell went to full time school I had a six6 whole hours to work, which seemed amazing. But it very quickly goes, I try to focus on doing one particular task in my day, and make myself into a one woman production line to maximise my efficiency. If I try to do too many different tasks, I get far less done. What is your style inspired by? My cards celebrate the beauty in the little everyday things all around us, and my cut paper images are mixed with 1930’s patterns, spots and of course my beautiful origami papers to create my look. My artistic inspiration comes from many sources but particularly children’s book illustrators – I love Lydia Monks, Lauren Child, and Eric Carle. What advice do you have for other ambitious mums? Play to your strengths, choose something you have an aptitude for and something you love, whether its design, cake baking or running a music group for kids – you need to have the skills and a passion for that subject to keep it fresh and exciting. Use your network of people around you for help and skills. I was lucky in that my brother-in-law works in branding and gave me some fantastic advice right at the start. Also my husband is a web designer, so he was built my website and my friend who is a teacher proof read all my copy for me. Just make a start however small. Selling at mother and baby groups was a great way to dip my toe into the world of being my own business woman. I got loads of feedback and made some money to buy materials. Keep it simple, too. If you sell through shops you need to get your overheads and materials costs right down as your wholesale price is much much lower than their retail price. Focusing on one product at the start will help you order in bulk so you can maximise your profits. And finally, social media is brilliant for small businesses. Building a website was not expensive for me as my husband could do it for me, but for most small businesses it’s a huge cost. Social media sites such as Facebook are a great way to give yourself a web presence at minimal cost. Twitter is also a great way to connect to other businesses and get advice and support. You can see more of Sally’s work and buy her cards on her website. You can also find her on Facebook and Twitter.